So as you can see, the sky is not exactly falling.. we just have people selling/taking profits. I traded FXCM profitably (14/15) but got caught holding the bag with XIV, but I position traded it since support did not break and hopefully I'll get out of it early next week with a small loss or a small profit if lucky. 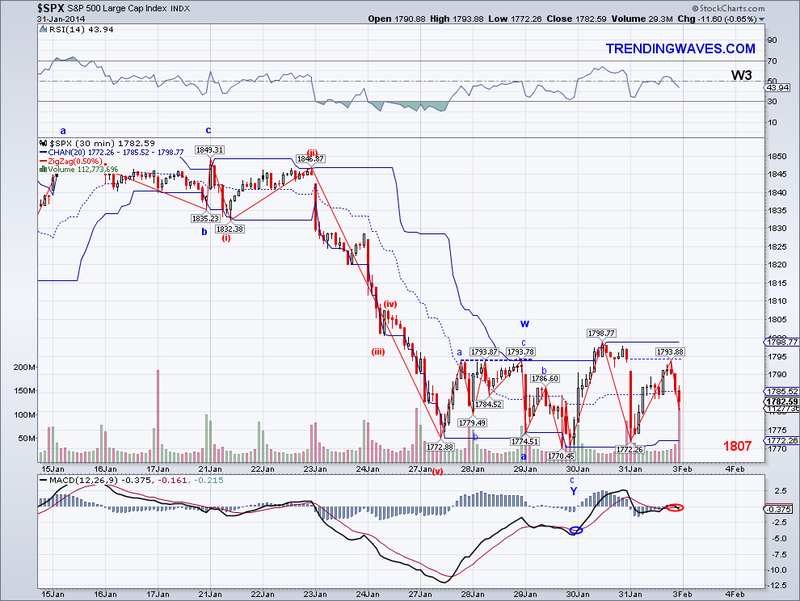 Once I am out of XIV, I will stay on the sidelines or trade mostly short as the trend is flashing red. The market bounced as I was expecting and it looks like it might have one more bullish leg (W5) left that might test the Trend Average before possibly coming back down again. The levels I am watching are 1807-1813, which is basically the most recent top (after hours cash equivalent) and the 50 Day Moving Average. On the support side, I am looking at 1782.92 as the level the market can not retrace into as that would eliminate the W5 possibility. If the market makes it to the resistance levels and can not overcome the 50 DMA, we will have a good a nice Head and Shoulder's set up so the next two sessions are very important. I ended up selling XIV (13/14) in the morning but perhaps a bit too early as the market went higher but profit is profit and I am not complaining at all. By the EOD the price for XIV had plummeted back to below yesterday's buy price so I ended up buying back the shares again in after hours. I am also experimenting with short term wave trade set ups on some individual stocks and I bought some FXCM as a test so we'll see how that goes. Hopefully we get a good gap up tomorrow and I will close a good trading month. The market did a 180 overnight and sold off today. The last option mentioned, which was the micro ABC was the right count as the market broke out of the Ascending Triangle and put in the cash equivalent high in after hours of 1807 and then sold off overnight. The cash count doesn't really reflect well this C leg but I take the after hours levels into account as now we have a potential bounce from support to that level again. The market put in a lower low but it did not break 1768 and given the Zig Zag look to it, the market is probably working on a bounce to test the 50 DMA again. I ended closing my long position taken at the EOD yesterday (12/13) and I guess I should have sold when the market was hitting the AT target in after hours trading. But my greedy side took over and I wanted to juice the market a few more points which in retrospect was not worth it because it was just a few points shy of my selling target (50 DMA). So I lost what I made yesterday today but I'm still having a good month and I bought back XIV at EOD today assuming 1768 will hold and see a bounce first before further selling. After hours are going up substantially again and I could sell now and make a quick buck but that wouldn't be fun :) That plus the fact that I don't really buy the excuses for the sell off, which started as a weak China PMI reading to now an "emerging market crisis", not to say there won't be further downside but I don't think there will be panic selling like in 2011/2012. The market gapped up as I was expecting but it retraced a good portion of the gap and put it an Ascending Triangle by the end of day that targets 1807, which could also be interpreted as a nested 1-2. So it seems likely that the market will mount a challenge to the 50 DMA in the next couple of sessions per the count I posted. One scenario I forgot to add yesterday is a "micro" ABC, meaning the market is working on a C wave that targets the 1802-1808 area (Thanks Eddy for pointing it out), which is just a few points short of the 50 DMA at 1813. 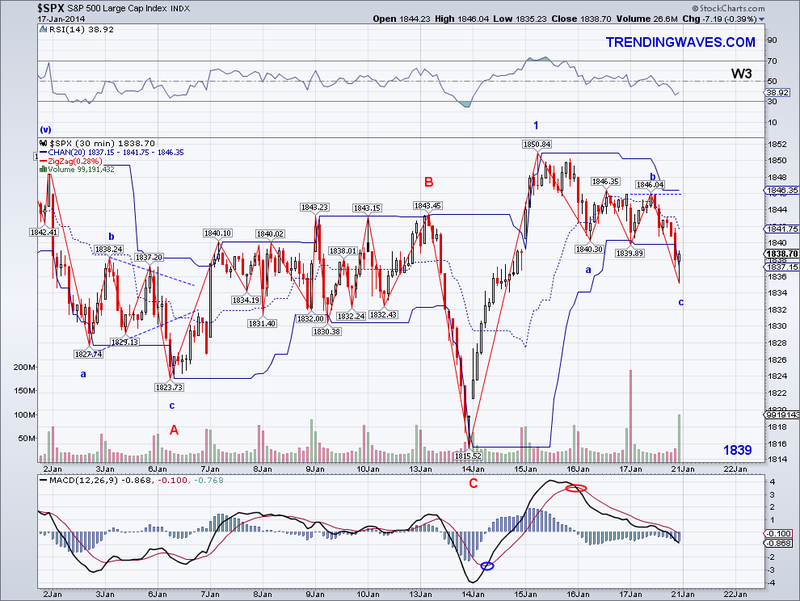 If the micro ABC is in play then we would see another bearish wave to a lower low for the month. 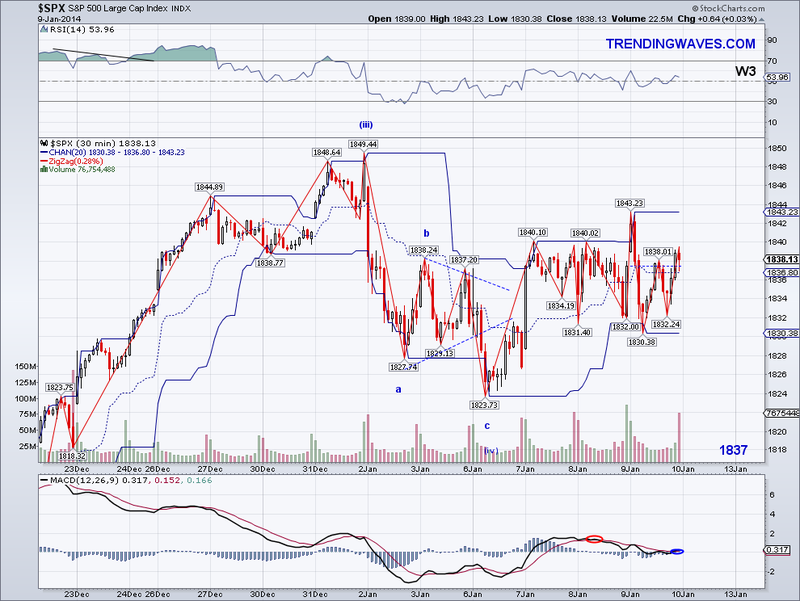 Personally, I lean towards a test of the 50 DMA and the Trend Average which will probably fall under 1820 tomorrow. I ended up making good money (40% of yesterday's profit) on my "bet" from yesterday but I didn't double it. 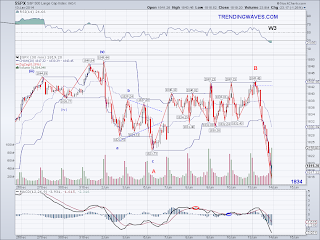 I sold XIV (12/12) when the market found initial resistance at 1793 and bought SPXL(3X SP500) in the last few minutes of the session when the Ascending Triangle break out seemed imminent. I hope to take profit tomorrow and then I'll have to decide to buy back VXX if the market reaches the 50 DMA. The market sold off a bit more today but found bottom at 1772, which basically forms the neckline for the potential Head and Shoulders I posted about on Friday. So far the bounce looks like it might be headed towards the 50 DMA but we must see a W3 tomorrow or a C wave to challenge this very important trend at 1813. 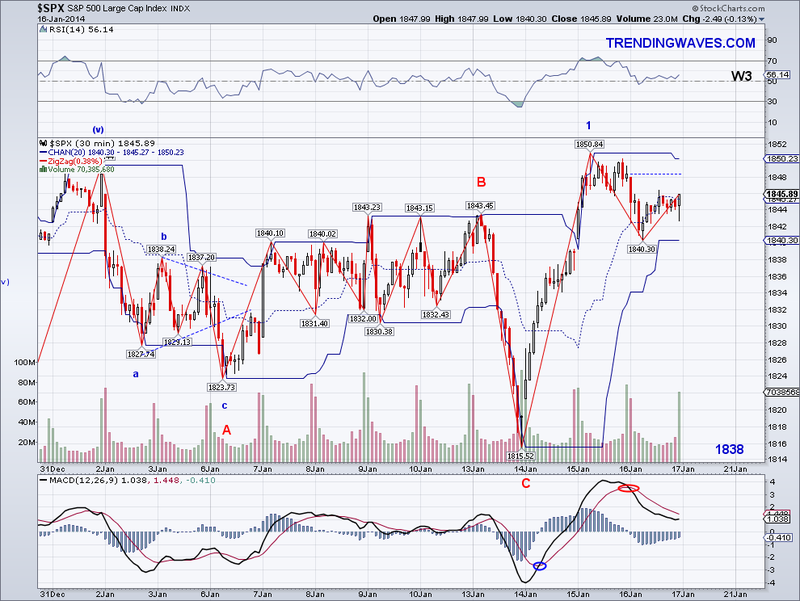 If we apply 1.618 to the coming bullish wave then we would get 1814 as a target assuming the 1781 W2/B low. 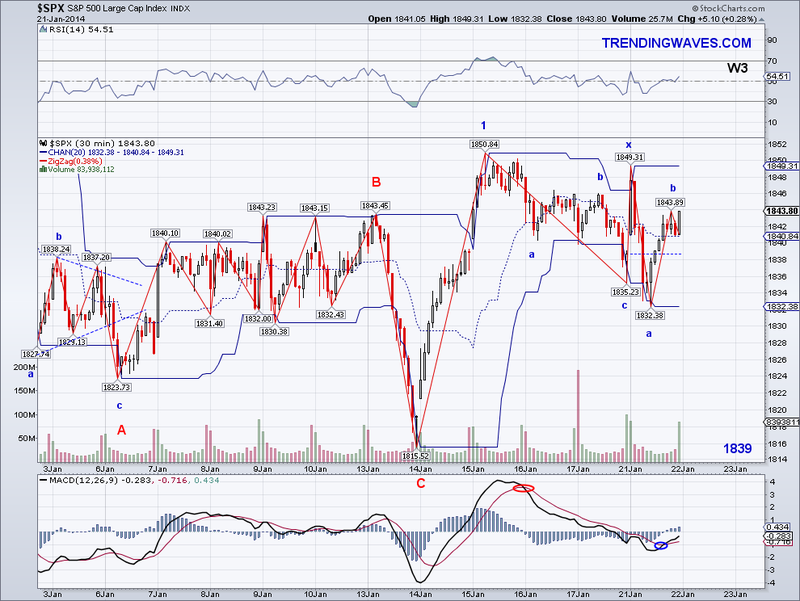 However, if this turns out to be a 5 count then the target will be 1825, which will be a test of the Trend Average. 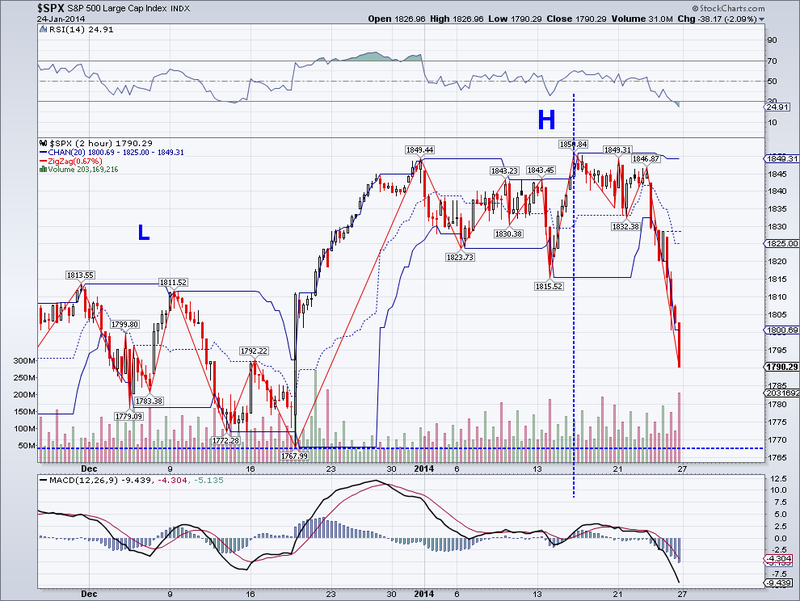 Another possibility is further downside tomorrow with today's high being a W4 but I lean towards the counter rally. 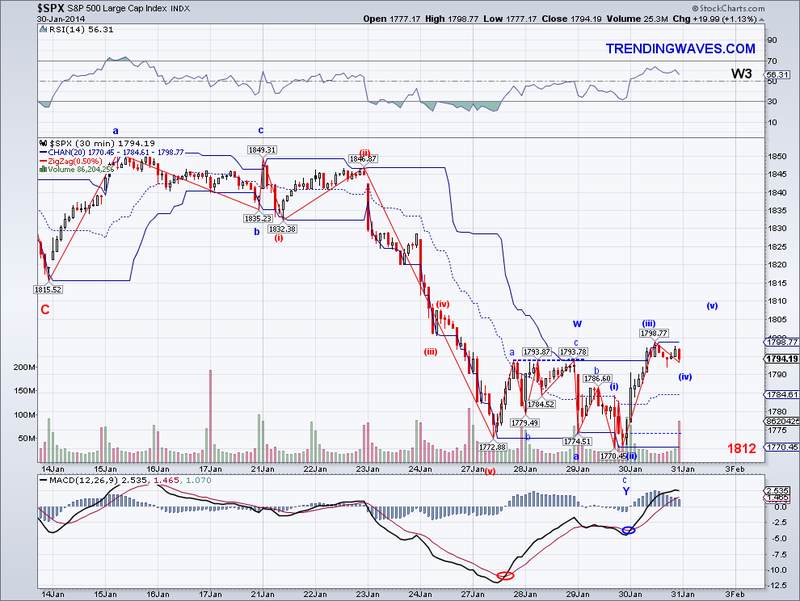 I executed my trading plan and bought XIV as the market got close to the 1768 target I had in mind. I closed the position at 1790 (11/11) with a very nice profit but then I decided to double down on my profits by getting back in towards the end of the session. So I will double what I made today if I am right on the W3/C or likely lose all my profits from today by setting the stop at today's low. I normally like to take some profits just to be safe but I guess I'm enjoying the adrenaline rush..lol. One thing I do know is that what started the selling was an excuse to sell not really a change in fundamentals. So should the market tank, specially Chinese shares, I will be buying more of them with some of the cash I've raised in the last year.. to me this is a no brainer. The market followed through on its selling from yesterday and broke key support (50 DMA at 1812) so the bears are now in charge. I was expecting a correction but only after the 5 count was finished so I didn't think the sell off today was likely but it is what it is so we just have to position ourselves to profit from the coming waves. There is the possibility the market is working on a Head and Shoulders formation and if that is the case we should see the market bottom close to 1768 and then bounce back to the Trend Average, so a good trade set up would be to wait for the market to get as close as possible to that level and then play the bounce. If the H&S pattern evolves perfectly then we're looking at 1680 as the downside target, which a bit below the 200 day moving average currently at 1701. Obviously, even if the market starts counter rallying on Monday it will have to overcome the Trend Average. Any failure to turn the trend back up will likely result in lower lows. Is hard to say if this is beginning of the LT Int W4 I have been looking for since November but so far it is looking like a good start so I will be ready for it. We have to keep in perspective as to why the markets are selling off and the reason so far is really a non issue IMO, as I said yesterday the main excuse was China's PMI but the Chinese market has actually been rallying not selling off. So once the correction is done we will see people remember why the market was rallying in the first place. I ended buying XIV when the market hit 1800 and bounced but sold it for a small profit when the market failed to mount a meaningful rally. I will be buying XIV again if a neckline forms on the H&S and then hopefully VXX near the TA, I am currently 10/10 on these short term trades so it's a good start for the year. Now, I do have my ST long position invested in a China related ETF underwater so I will position trade that one until I come out of it in the green. Hopefully we'll see some more panic set in next week so we can have a clear pattern to trade. 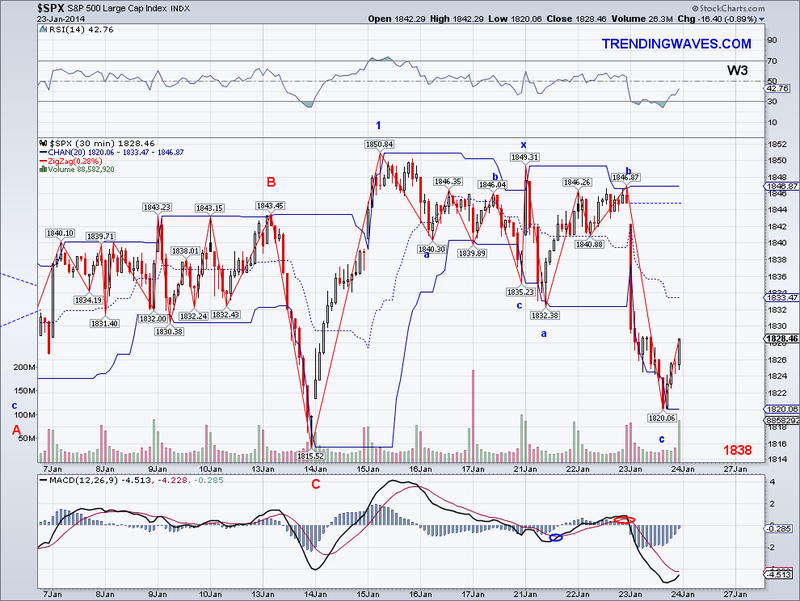 The bearish wave I was looking for finally appeared today and it broke through the 1830-35 area I was looking at as support. However, since the wave is part of a double Zig Zag and a C wave, it still falls into a correction rather than the start of anything more meaningful. 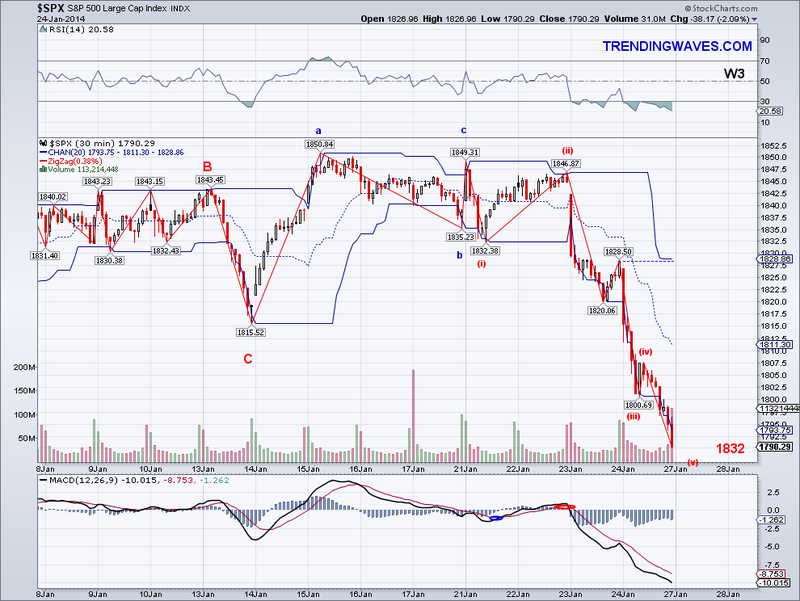 Also, this wave was about 1.6 of the A wave so technically there's nothing out of the ordinary. With that said, the Trend Average turned negative but I would only start entertaining bearish options if there is follow through selling that breaks the previous low of 1815 and specially if support at 1811-13 breaks. Fundamentally speaking, the reason for the bearish wave was the PMI in China which is usually weak this time of year so I think this was used more as an excuse to sell than anything else. If the Chinese stock market is of any indication, the SSEC fell less than half a percent after the PMI news (after rallying almost 2% the day before) and all loses were regained and some at the time of this post so obviously they don't care. The market traded in a tight range today but I am still expecting a bearish wave to test the 1830-35 area before another attempt to break the all time high again. Earnings haven't done much as far as moving the markets but it is the ideal catalyst to push the markets out of range so perhaps a few positive announcements from the main companies and we'll have that new high? For now I am holding on to my longs and getting ready to add VXX to hedge again as it has dropped to another 52 week low today. I thought when I went to sleep last night that I would wake up to a new all time high but unfortunately that wave was stopped at resistance so the correction continues and now it seems like we might get one more test of the lows and complete a double ZZ. Whatever the case, the market wants to go higher so I will be buying back VXX when the time comes. I set my stop at break even on my ZIV and unfortunately it got stopped out in the morning on the bearish wave so maybe I'll load up again if we get another test of the lows. 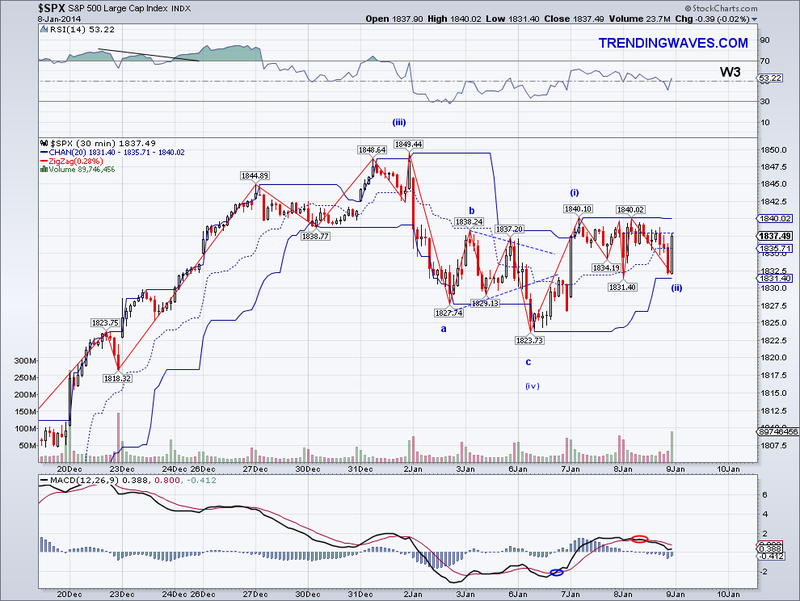 The market put in the C wave I speculated about yesterday and it bottomed in the mid 1830's area before climbing back up to close right on the Trend Average. So now we have enough of a correction for the market to start the next bullish leg and perhaps put in a new all time high next week. The market is free to do another Zig Zag before launching but oscillators have been reset enough for a bullish W3 which if it happens will likely turn the daily MACD back to bullish. I think sentiment is overwhelmingly positive at the moment with some shadows of pessimism here and there but the path of least resistance continues to be up. I ended up buying ZIV (short int volatility) for the first time and I'm hoping to see that bullish W3 next week to see how it does. My plan this year is to use ZIV as my primary short term long and VXX as the hedge, that way I keep things simple and hopefully very profitable. 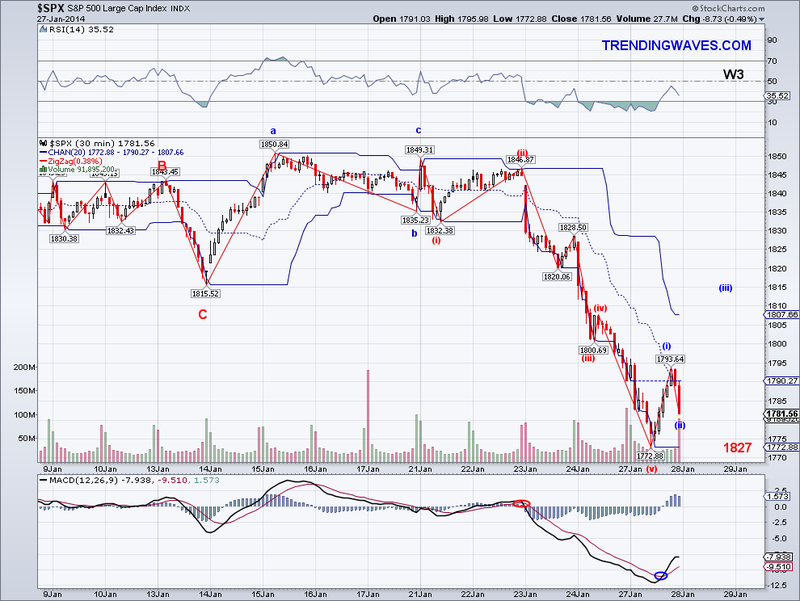 The market started its correction as anticipated but not sure if it is a W4 or a W2 yet. 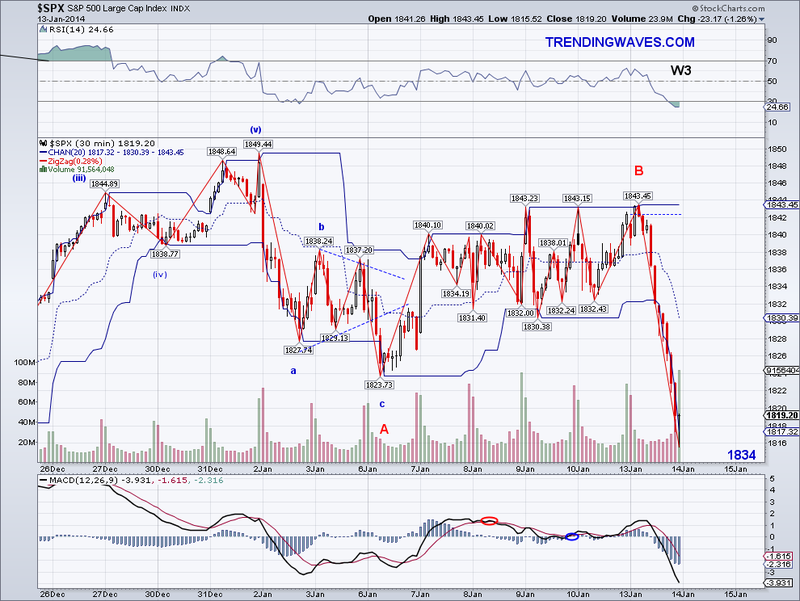 The market got somewhat close to the TA but it never went below 1840 so there could an ABC move in the works with a C wave coming tomorrow or the correction could be over already. 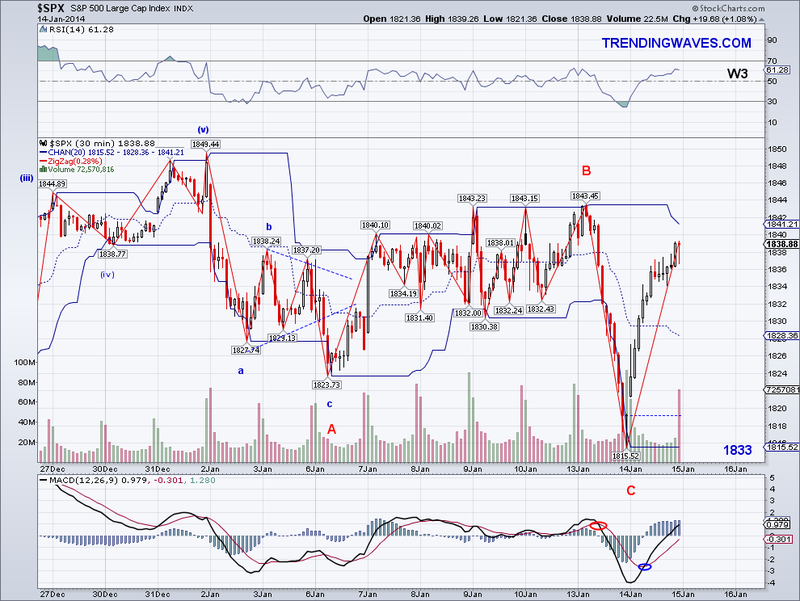 We'll have to wait and see how the coming bullish wave develops. I am however playing it safe so I sold my VXX today for some profit and will wait for a sub 40 price (or something close to it) before getting back in. I just need my longs to do their job! I don't usually get surprised by the market but I have to admit I didn't see this one coming despite having labeled the drop to 1818 a C wave. I figured there would be some sort of hesitation before a bounce or a rally but I guess it just goes to show there are some desperate bulls out there buying every single dip. In fact, I can't really remember a similar situation where a sharp sell off waves gets answered with a sharp rally on NO news. But it is what it is and I welcome whatever the market wants to throw at us. The Trend Average was obviously whipsawed and the trend is now back to green after spending just one day in red. Luckily for me, the VXX I bought yesterday was actually profitable today but I figured I'll just take profit when we get a correction to the TA. You can't really see the micro count on the 30 minute chart I posted but there are 4 waves completed so far and perhaps there will be one last push in pre-market or tomorrow before the market goes into a correction. The market tested the Trend Average and some today by staging a strong counter rally that looks as strong as the bearish wave from yesterday. 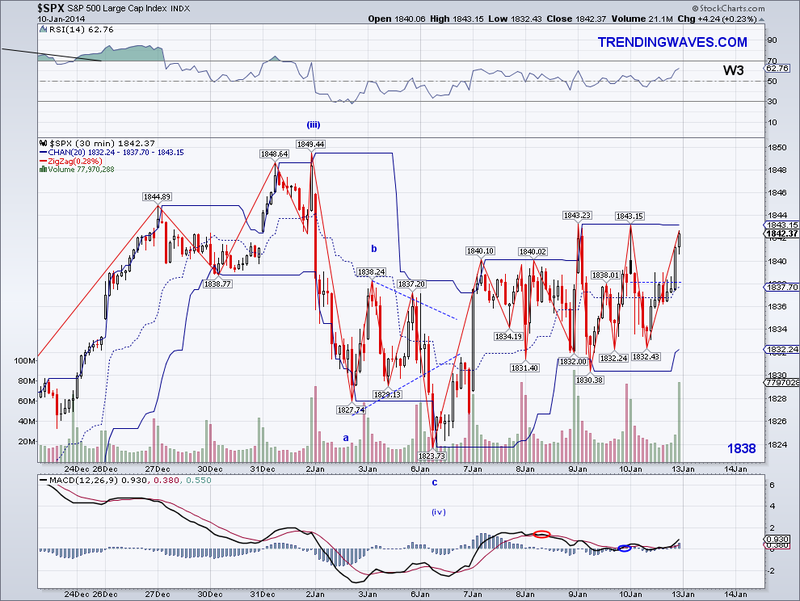 However, the burden is still on the bulls as anything less than 1843 is just a bounce from the lower low made yesterday. Also, on the micro count there are 5 waves complete and that could mean today was the A leg of a corrective move or even the end of the counter rally so we'll just have to wait and see how the bears respond. I ended up buying back the VXX I sold yesterday cheap since whatever reason that existed yesterday for the sell off was completely gone today. But fear will come again and I will probably be selling my hedge again to pay for my home improvement projects. The market's failure to break the 1843 resistance level left from last week resulted in the most "significant" sell off in 2 months today. 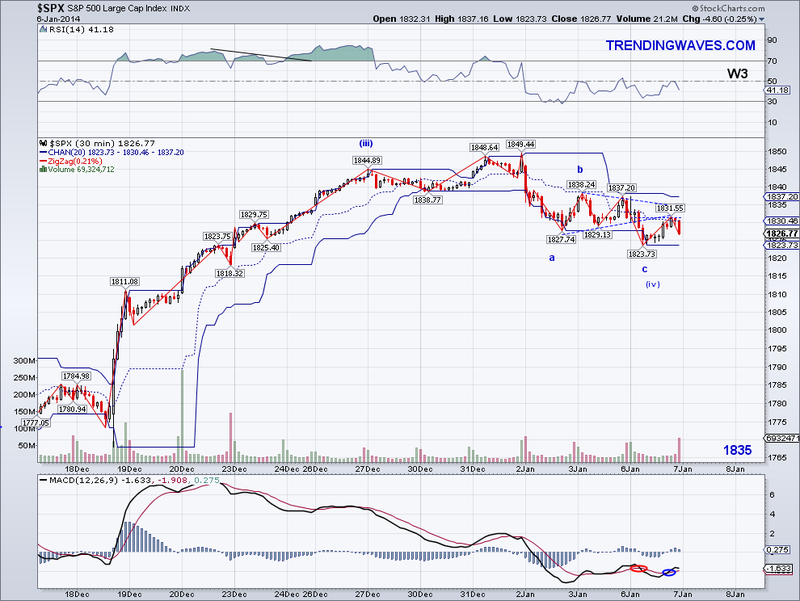 Obviously, the IHS has been invalidated and so far it looks like there is a bearish stand alone W3 so we could see a slight bounce and then a lower low. The reasons for the sell off vary depending on which media outlet you watch but it seems like the excuse is mainly earnings anxiety and fear of taper. So if we get a bounce that gets stopped at the Trend Average, I assume there will be a bigger bearish wave that will take the market under 1800. 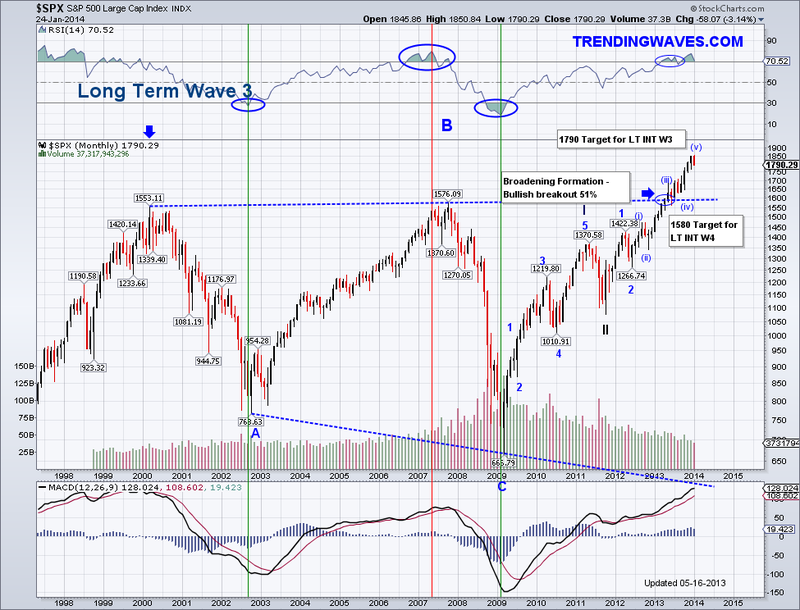 After all, a LT Int W4 was supposed to start at 1790 and perhaps this is the multi-month wave that will reset all the longer term oscillators and test the 200 Day Moving Average? 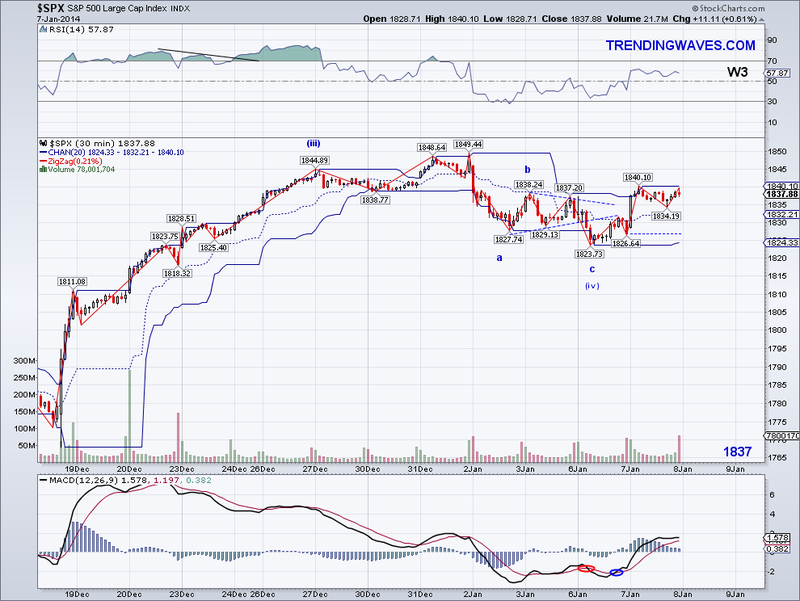 It's still too early to tell so I am labeling the move from the high as an ABC but should the "C" wave gain traction then it will increase the probabilities of a 5 wave count. The near term level to watch is 1811-13, if that breaks there is a stronger support cluster at the 1775-80 level so I will be watching how the markets bounces before getting into a new position. The jobs reports came and nothing much happened, so I was wrong in my assumption we would see a significant move today. Perhaps, the fact the number was so low below estimates (79,000 act vs 200,000 est.) it ruined the mood for a rally. 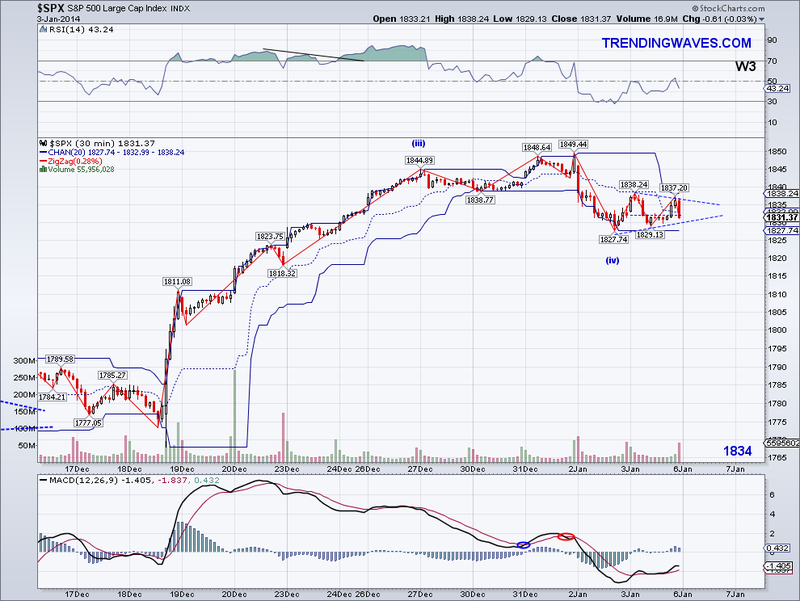 The market still has the IHS formation but it is starting to look odd due to all the failed break outs. Also the market managed to close over the TA so the bulls have not given up just yet. However, I decided to buy back my VXX to hedge my longs due to the market's indecision and the confirmed bearish daily MACD cross over so I am expecting downside starting early next week or soon after a bullish break out. I saved me a good amount of money by position trading VXX so now they just need to do their job as I am still waiting for my fence money! lol. The market seemed like it was following a 5 count at the open but then it reversed completely to test the 1830 level again, which has held well so far as every single attempt to breach it has resulted in decent bounces. 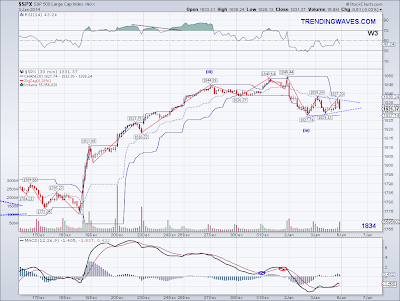 Normally, IHS break outs are in form of a W3 and the market left a 1-2 on the micro-count towards the end of the day but should this coming wave fail to fully break out of range tomorrow morning then support will probably not hold so well next time. So everything comes down to the jobs reports tomorrow , what remains to be seen is how the news will be received. A strong report should result in a new all time high IMO but since now the idea of good news accelerating taper is floating around as a sell excuse, we could also see a bearish response (never mind the market rallied like crazy the day taper was announced..lol). The bottom line to me is, if the economy generates the estimated number of new jobs then it's all good. So as tempted as I was earlier today to buy back VXX, I will wait for an even better price to buy back. Last but not least, the market closed again above a flat lining Trend Average so there will be a significant move very soon. The market seems to have put in a flat correction today and now we have a good IHS pattern in place so the next most likely move will be a break out of the pattern on a W3. I am assuming the jobs report will be the excuse regardless of whether it is good or bad as now that taper has been announced these types of news can be used by the market to make significant moves. But obviously, there are no absolutes in the stock market so we'll see if the labels on the chart are correct tomorrow/Friday. I am hoping my longs will some traction tomorrow and hopefully I will be buying VXX in the 40s if the all time high gets taken out. 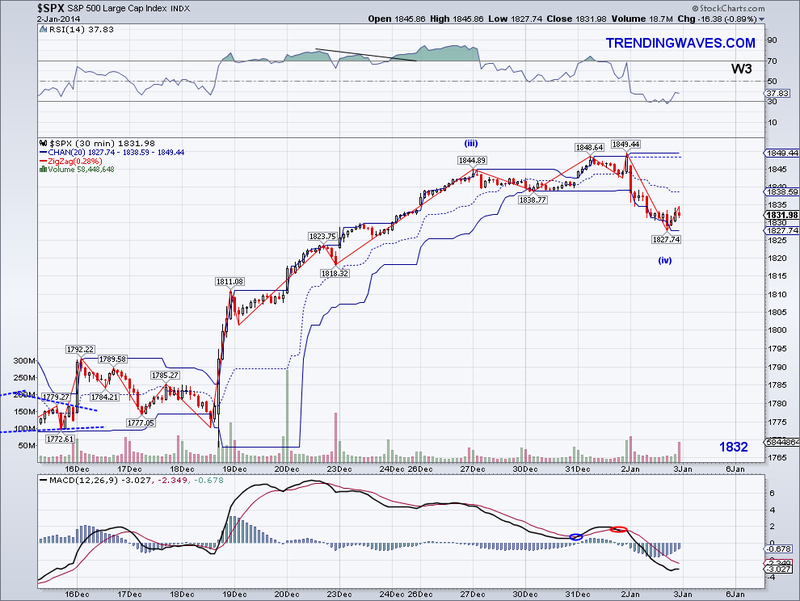 I forgot to add the TA on the chart but it is currently at 1837 but almost going flat. 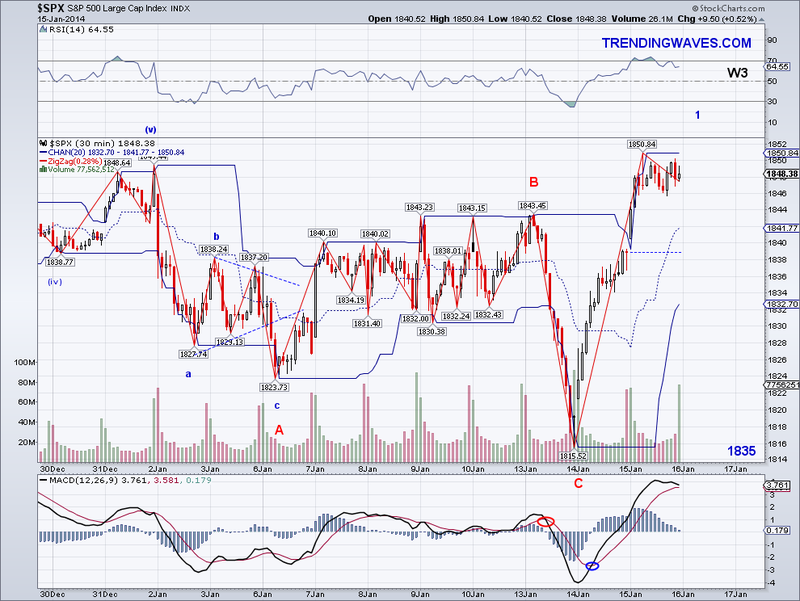 The market has recaptured the Trend Average and it looks like an bullish impulsive W1 is being formed. Once I see a 5 wave structure on that potential W1, I'll be able to make some projections which will without much doubt make a new all time high. 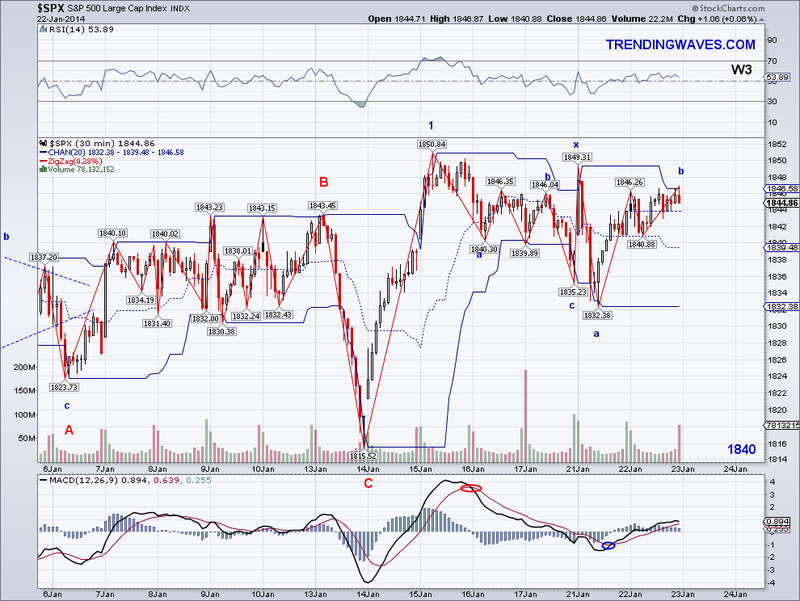 As it is there is an Inverse Head and Shoulders targeting 1854. That bearish micro wave breaking out of the Triangle yesterday was indeed a non-impulsive wave despite making a lower low and I am glad I was able to catch it and sell the VXX I had, which sold off today. I just wished my longs were doing better but once I exit the position I will go with XIV and just use that as my short term long for the rest of the year. New all time high ahead? The bears made an small advance today by breaking the Triangle to the downside and we should know in the next session or two if this is a W4 correction with a new all time high coming or if the market has made a significant top. One thing I noticed on the micro count was the micro W1 had overlapping W4>W1 waves, which technically nullifies the impulse wave. 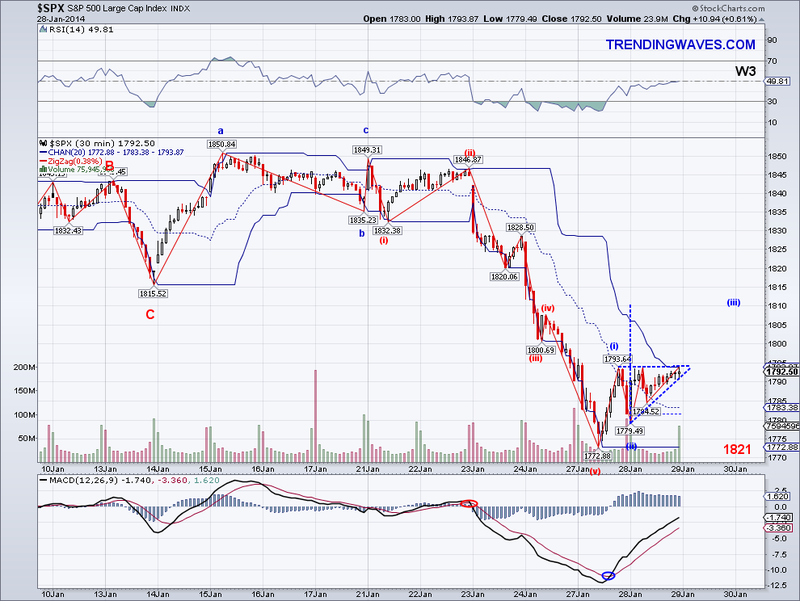 One can't really see it on the 30 minute chart I posted but that wave out of the triangle is not an impulse. Therefore, unless we see a big sell off tomorrow or the day after my guess is there is a good chance we'll see a bullish wave develop to challenge 1850 again. I closed my VXX position for a small loss but I am buying it back on the next bullish wave as the VIX went down despite the market's bearish day (not a good sign for bears). 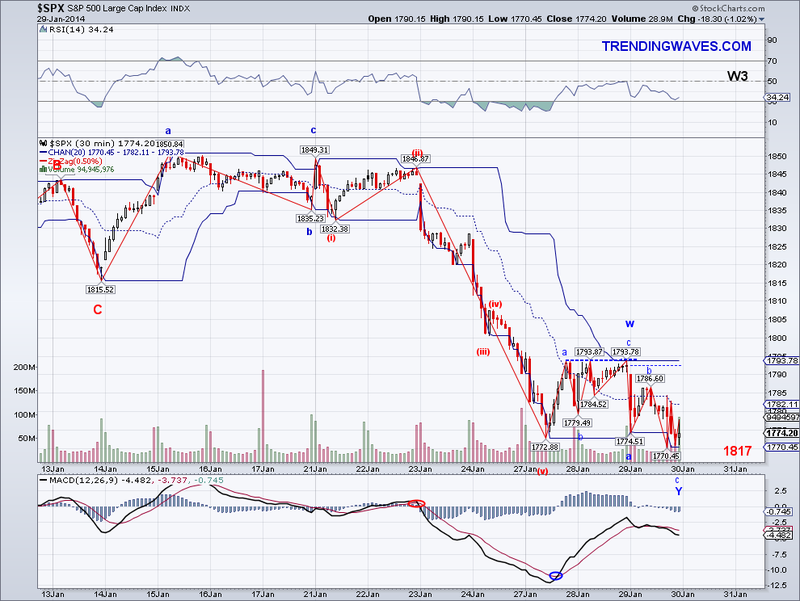 The key levels to watch will be 1813-1816 on the downside, if these levels hold then the bull case is alive and well. If not then down the market will go. 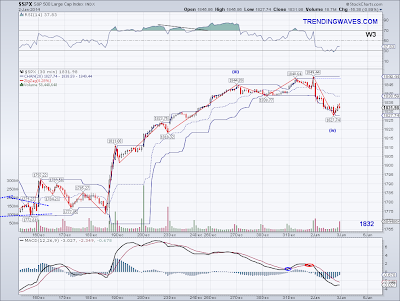 The short term bullish trend is being challenged and we'll see if the market can recapture the TA before turning red. The market took another stab at the low from Thursday but it ended being a higher low, which could be interpreted as a nested 1-2 set up targeting 1850. At the same time, one could make the argument for a consolidating triangle forming a base for another bearish wave so the short term direction is not very clear. 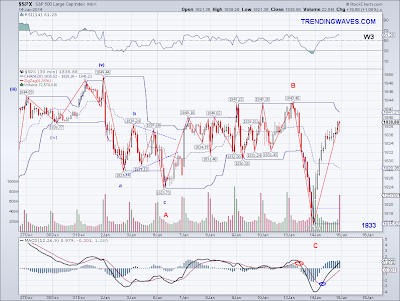 The count however does favor this being some sort of consolidating wave before another high and the chart would have a better look if that was the case. But with Trend Average being challenged, I wouldn't bet on it. The key levels to watch are 1827.74 for support and the 1838.24 for resistance, whichever breaks first will likely point to where the next wave is going. I am holding on to my positions but will probably close one of them depending on where the market goes. We finally had a "significant" correction after a 2 weeks of rallying and the market came down to test the Trend Average and closed on it but due to rounding I have it as 1832 on the chart. So I am going to assume this is a corrective W4 of a smaller degree with another high to come unless the Short Term trend turns negative, in which case I will assume there will be a correction that will go for the 50 DMA at the very least. Obviously, it would help (the correction that is) if we had some sort of bad news but so far there isn't much the market can use as an excuse to really sell off. Perhaps, we'll start seeing something bad in the next week or two? One troubling article I did see earlier today was on permabear Roubini turning bullish and if he is joined by the likes of Marc Faber and Doug Kass then we'll know the market is about to top! lol.. I forgot to write about it but the day the market found a bottom, Faber was on the news talking about how the market had topped at 1813 and so on. Bears getting airtime usually is a sign of a bottom.. works like clockwork. I continue to hold both VXX and my longs. Still looking to pay off the rest of my front gate with Volatility.